Billy Smith, Elvis' cousin, talks candidly to EIN. Billy Smith interview Part Two. Billy and Jo Smith live in Mississippi are still together after all these years, true survivors. They now have six grandchildren. 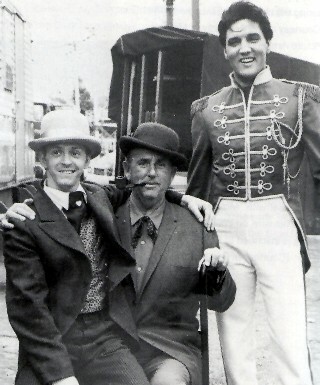 As Billy poignantly said, "When I was working for Elvis, Jo and I spent a long time apart. And what time we’ve got left, we try and spend together. Because we have that fear that if it can happen to Elvis Presley, hell, it can happen to us, maybe tomorrow." In Part Two of our interview Billy talks about Elvis’ Girls, The Later Years, his relationship with EPE, 'Elvis By The Presleys' and more. EIN: You are close to Priscilla in age, so what was your relationship like with her, especially when she first arrived in Graceland? Billy: When Priscilla first came to Graceland, she was a little shy. We always got along well, I thought. EIN: How did your wife Jo get on with Priscilla, were they good friends? When was the last time Jo saw Priscilla? Billy: Jo and Priscilla were close in the early days. They used to go places together while we were out of town, and when they came to Los Angeles. Jo and I stayed at Elvis' house along with Priscilla. They went shopping together and were close. At Graceland, they did many things together along with Patsy Lacker, Marty's wife. Marty and Patsy lived at Graceland at that time. The three of them became close and Jo and Patsy still are. They remained friends to this day. However the last time that Jo saw Priscilla was after Graceland opened. EIN: Few people would have heard about Priscilla’s flirtation with singer Mylon Lefevre in the mid-sixties. Can you tell us anything about this, was it anymore than a flirtation? Billy: As far as I know, she only met him. I really don't know enough to comment on that as we were in Los Angeles at that time. EIN: What did you think about Ann-Margret, did you get to see the two of them together? How long did their relationship/friendship continue for? Was she the right partner for Elvis? Do you think Elvis really thought of leaving Priscilla for her? Billy: Ann-Margret was wonderful! You could never meet a nicer person. She was so sweet and beautiful and Elvis adored her. He had a pet name for her. Most people thought it was Rusty, but that's not it. He had a special name he called her. We all loved Ann. I think it crossed his mind to stay with Ann. EIN: How did you & Jo get on with Linda Thompson & was she good for Elvis? Billy: We loved Linda Thompson. Jo and Linda were friends, along with Patsy Lacker. The three of them got along great. But, Linda got along with just about everyone. She was great for Elvis! She took care of him when she was there. EIN: Do you ever hear from Linda Thompson or run into her nowadays? Billy: I haven't seen or talked to Linda in a good while. She lives in L.A. and I live in Mississippi, but Linda was great. I think everybody liked Linda. EIN: What are your thoughts on Ginger Alden? Would they have got married? Billy: Ginger always thought so. But Elvis had a way of putting things off. He always said "when the time was right". And he'd laugh... the time just never was right. I don't think they would have married. Billy: Dr. Nick tried to help Elvis. Elvis was a strong willed person, and he did exactly what he wanted to do, in most cases. In my opinion Dr. Nick was good. 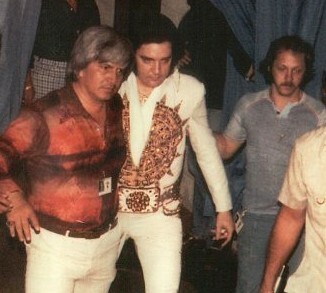 Billy Smith (right) working on tour with Elvis, 1977. EIN: When you were On Tour with Elvis what was your main role? Billy: Just basically keeping Elvis company and being with him. In the later years a lot of the times it would just be me and him. I was family and the closest person to him. There were nights when we’d spend hours and hours in his room talking. Just me and Jo, with Elvis and Linda. EIN: Did Elvis ever suggest to you the idea of touring overseas? Was this a lost opportunity? Billy: Sure, Elvis wanted to tour overseas very much. But Colonel put that aside! EIN: So did your relationship with Colonel change over the years? Billy: I guess somewhat. In the early days I admired colonel. He had a very strong look and piercing blue eyes. You knew he was in control. When I got older I saw that things were changing between Elvis and Colonel. He started picking on the guys, including me, for information about Elvis. Colonel always liked me and my family but my loyalty was always with Elvis. Of course I had known Colonel since I was a kid. EIN: Do you think that he overworked Elvis? Billy: Elvis wanted to work or if he didn’t he would find some excuse not to. EIN: So what concerts have great memories for you? EIN: Did you visit Elvis during the period you weren’t working for him and looking after your sick Father? Could Elvis talk to you as ‘family’? Billy: I always visited Elvis when he was in Memphis while my father was ill. I also went to Vegas to see him and we were always able to talk about everything. We talked as family and about family. I guess that's why we were close. . .. We always had family and the early years in common. Elvis was a way of life for me, Jo, and our two sons. It was hard at times but we had a lot of opportunities that we wouldn't have had, had it not been for Elvis. We loved being a part of his world. We feel blessed to have been with him. And he will remain in our hearts forever. EIN: As you were family, did you ever manage to talk to Elvis about his drug intake? What did he say? Billy: Elvis did not want to talk about his drug intake because to Elvis, he did not have a problem, and he would let you know to mind your own business. He would say to us all, "I know what's best for me." EIN: Do you know why Vernon didn’t make stand on Elvis’ drug taking? Wouldn’t he have been the one person who Elvis might have listened to? Billy: I don't know why Uncle Vernon didn't try harder to make Elvis see. We all tried in our own way but Elvis didn't want to change anything at that time. And, he had to be the one to help himself - and he didn't! EIN: In 1975 Elvis had the eye-lift in Hospital. Do you think it changed his looks and is it true that you tried to talk him out if it? Billy: Yes, Elvis had the eye lift, and Linda, Jo, and I stayed with him at the hospital. Yes, I did try and talk him out of it. He didn't need it, he looked great. How do you improve perfection? The doctor even told him that. But, he wanted it, so he got it! I don't think it changed his looks that much. EIN: Elvis obviously had great trust in you. Can you tell us the story of him getting into bed with you and Jo to share his thoughts? Billy: He got into bed with us many times at Graceland when we would spend the night there in Lisa's room, or on tour in the hotel, and at the trailer on the property at Graceland. So, yes, I guess he had a great trust in me, and I did him, as well. After all, we were all three there talking for hours about everything in the world! Sometimes he would have a bad dream and come looking for me to talk to, and he would actually fall asleep in our bed with us. That happened a lot of times, and we thought nothing of it. I felt good that he said he needed me to be there. EIN: When you listen to the tapes of The Jungle Room sessions Elvis sometimes sounds happy & sometimes low. What do you remember of the Jungle Room recordings sessions? Billy: I thought the Jungle Room sessions were good. For some reason Elvis decided to play bass guitar on ‘Blue Eyes Crying In The Rain’ and I remember Elvis laughing when J.D hit that real low note on ‘Way Down.’ Elvis did have fun on those sessions. EIN: What was the last vacation in Hawaii like? Billy: That was in March 1977. We had a great time. Elvis seemed to enjoy it a lot. Elvis got some sand in his eye and got an eye infection and so we came home a little earlier than planned. EIN: What’s your opinion of Red & Sonny’s book "Elvis: What Happened"? Did Elvis talk to you about it & did he try to stop its publication? Billy: Yes, I read Red and Sonny's book and told Elvis what was in it. He was upset about it. We talked some about the book, and he did not want it to be published. EIN: On the final night you played racket ball with him and then he sat down and played the piano. Was ‘Blues Eyes Crying in the Rain’ the last song he sang at the piano, and was he in good humour? Billy: Elvis seemed to be sluggish and not in the best of shape. He tried to do things and keep active, but he just was not up to it. 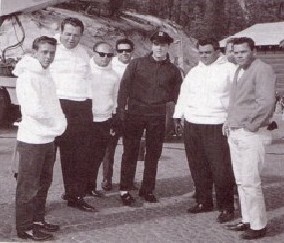 Elvis was moody sometimes, but, he was looking forward to the upcoming tour. On the final night, Elvis, Ginger, Jo and I went to the racket ball building and played a game or two. He was in a very good mood, but didn't really get down to playing a serious game. Mostly, just trying to hit me with the ball! We sat around the piano, and yes, he sang "Blue Eyes Crying in the Rain." He was joking and laughing. We went back up to the house. I went upstairs with him and helped him get ready for bed. He hugged me, said, "I love you and Goodnight. . . This is going to be a great tour!" EIN: Larry Geller mentions a different will – possibly a hand written one. No one can understand why Elvis wouldn’t want to have left you something to live on after all your time looking after him. What are your feelings about this? Billy: Yes, I saw a different will. Elvis updated his will before we went to Hawaii in March of 1977. He gave it to me to put up for him and told me to read it. I put it up -- after he died, my cousin Patsy called me asked me if I knew where it was. Uncle Vernon was looking for it. I told her! Elvis always told Jo and me that we would be taken care of as long as he lived and we were. And that if anything happened to him, we would be taken care of. EIN: After Elvis died you worked as a Graceland Tour Guide Supervisor for a while. What happened there and what are your feelings towards Graceland itself? Billy: Yes, I helped set up the trophy room, and I was a tour guide supervisor for a while at Graceland. I didn't see things the way that the people in charge did, and I couldn't be a part of something that I didn't feel good about. I was fired -- I tried to call Priscilla, but she wouldn't return my calls. I did reach Lisa one time, but Lisa was not in charge at that time. I don't have good feelings about the whole experience. But, they did what they thought was best. Graceland was my home for many years, and I loved it there when Elvis was there. It was home with a great feeling of belonging and love. After Elvis died, it wasn't home anymore, and the feeling was no longer there either. EIN: What is your view on how Priscilla handled running of the Estate after Elvis' death? Billy: I think Priscilla did a good job. She made a lot of money! EIN: The sale of the operational/marketing arm of EPE to Robert Sillerman. In your opinion, is this a good or bad thing? Billy: I don't know about the business of Graceland and don't really care to. We had Graceland during the good times, and the memories that I have of it will be with me forever. I have so many. All the family, the fans, the guys - I wouldn't trade all that for anything. I remember when we first moved there. I thought I had gone to Heaven. Aunt Gladys, my parents and brother, my cousins, Elvis, all the many friends -- we had such good times. Christmas was unbelievable. Elvis loved Graceland, and I guess anyone whoever spent time there did, too. EIN: A lot of fans were upset because you weren’t involved in the ‘Elvis: By The Presleys’ project. I feel that it really should have been called ‘Elvis By The Beaulieus’. Was the project ever mentioned to you and what did you think of the actual show? Billy: Well, as Marty Lacker and I talked about it, I guess everyone wants to be the most important, but you can't tell a true story of Elvis and Graceland without including everyone who was involved. Whether you like them or not! Fact is fact, and the fact is that many of us were left out. That's the same way it is when one of the guys tells something. I feel like everyone that was there and had a part in Elvis' world should be portrayed to make it accurate - or else something is missing. As we've talked about, there was a lot of jealously but I don't know why because everyone that was there had a special place. But each person tells it like they would have wanted it to be and maybe not how it was. EIN: There are suggestions that you haven’t spoken to Lisa Marie in years, is this true? If so it must sadden you - what caused this situation to occur? To an outsider this seems crazy as you spent so long with her dad. Billy: No, I haven't spoken to Lisa in many years. I don't really know why. But after I was fired from Graceland, I lost contact with Lisa and Priscilla. It must seem crazy as of course I spent most of my life with Elvis before he died. EIN: When you get together with the guys to chat about old times, like for ‘All The Kings Men’ or for the more recent BBC ‘The Elvis Mob’, what’s it like sitting in a Beale Street bar with the four of you reminiscing? Does it feel like 28 years ago, is it like "family"? Billy: When we all get together (the guys), it's great. One of us can start to say something and the rest of us already know what is going to be said. All the guys were like family. We spent more time together than with our own families. I've known most of them since I was a kid and I still remain close to most of them. I see Marty most of all. We were always close, and Jo and Patsy, and our kids grew up together. Lamar, Sonny, and Red I've known them most of my life. I see some of the others on occasion. I miss the ones that are no longer with us, and I miss the times we had. Most of us had wives and children, and we were like one big family. We travelled, worked, and lived together for many years. 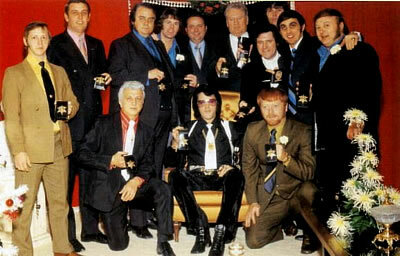 Most of us remain friends today, and it's all because of our love and respect for Elvis. EIN: Would you have done anything different? Do you have any regrets? Billy: I think I would have done some things differently. But, over all, we did what we had to do at that time, and over all, we're better for it. I have some regrets. But, I wouldn't have missed being a part of it all for anything. EIN: What is your favourite memory of Elvis, the one that always brings a smile to you face? Billy: Oh, I couldn't pick one favorite memory. I have so many. It would take forever to go into all of that! I loved the time at home when we were all together just having fun and doing all the crazy things we did. Everything we did stands out! EIN: Do you dream of Elvis? Does he still talk to you? Billy: I sometimes dream of him, and he talks to me all the time in many ways. There is never a day that goes by that I don't think of him and something that he's said. It either brings a smile or a tear. And, which ever it is, I'm thankful! EIN: Thanks so much for taking the time out or your busy life to answer all these questions, you know the fans really appreciate it. You are a real survivor and a true gentleman. Billy: Thank you for asking!! Billy Smith was interviewed by Piers Beagley for EIN, January 2006. - Copyright Elvis Information Network 2006.